Kim’s original kitchen had a few strikes against it. For one thing, the tile countertops were a pain to keep clean. She knew there were original hardwood floors under the vinyl and wanted to restore them. 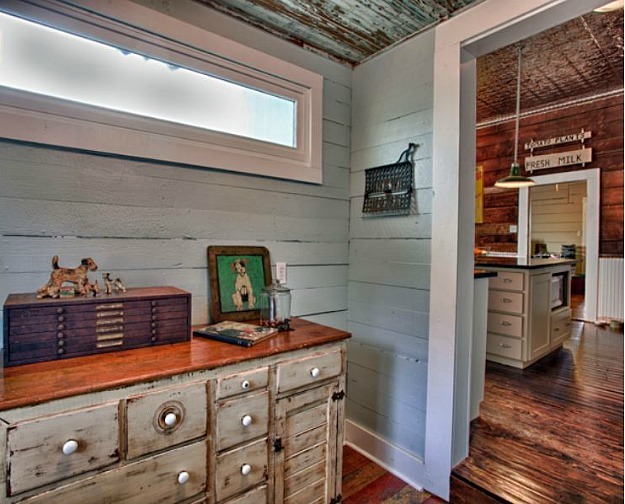 And since it’s in an old dogtrot house in Texas, she wanted the room to look a little less new. Here’s how she gave it a “new vintage” look! It’s quite a transformation. The acoustical-tile ceiling with the track lighting and ceiling fan were replaced by tin. The original wood floors have been restored. And the drywall is gone, revealing the wood-planked walls that were behind it. They painted most of them but left one wall, not wanting to cover all the original character. The original cabinets were moved to the garage, where they are now used for extra storage. “I’m always looking for a way to incorporate true vintage elements,” Kim says. 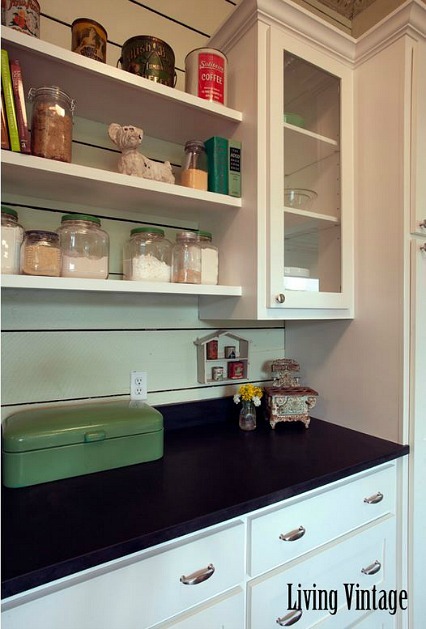 Kim had always wanted a walk-in pantry and they had plenty of space to create one. 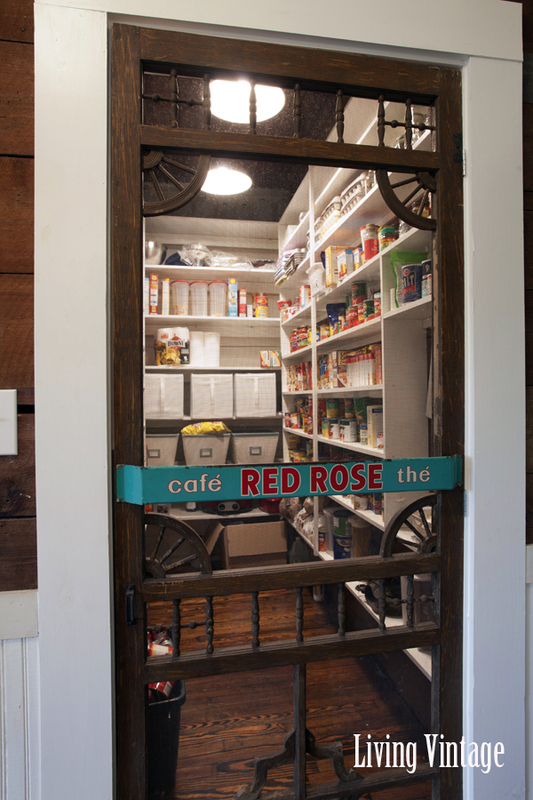 They found this old screen door at an architectural salvage store in Gonzales — perfect for the pantry. You may remember when I told you about the cool mudroom she built onto the kitchen earlier this year. You can see that on her blog, too. Alyssa Milano's Kitchen on the TV Show "Mistresses"
Wowzers! This is amazing! How thrilling that they uncovered so many of the vintage elements that were hiding! I do love all those signs and its great that the homeowner has a story to go with each one. So charming, very clever and quite refreshing! I absolutely love that old screen door at the entrance to that huge pantry. And instead of making a row of cabinets, Kim made it much more interesting by putting shelves in the middle. I could pour over these pics all day. Thanks so much for posting! Beautiful Love the Canadian shout out with the Red Rose Tea sign on the pantry door! Really love this one ! So charming and nice to see the personality of the owner come though. Well done! I really, really like this. My favorite part are the open shelves tucked between two cabinets on the fridge wall. 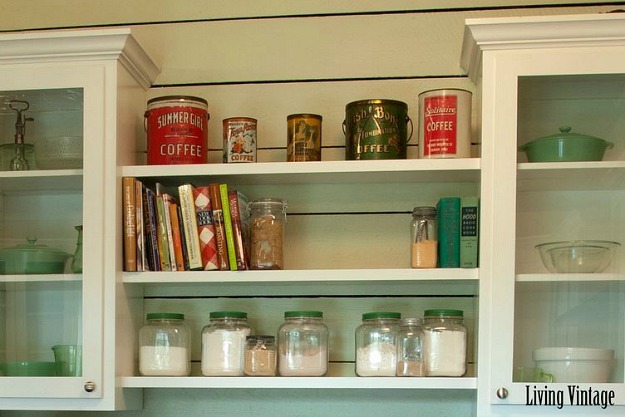 If Kim checks in here, can you share where you found the glass jars with green lids that hold your flour, sugar, etc.? I’m guessing they’re vintage or antique but I’m in love with them! She gives lots of details like that on her blog if you want to check for those! Thanks, Julia. I just checked and they’re not listed on her site or in the comments over there but I’ll keep checking! Hi, My mom has those glass jars with the green lids, they are from the 60’s. But they have good knock offs at Target. The lids are white, but you could find a depression/jadeite green to paint them. This is excellent. Love the restoration, the vintage decor, the lack of recessed lighting (thank you!! ), the floors, etc. Great job! This kitchen puts the AWE in awesome, + I mean that! Everything’s divine, but the vintage groovies are the best. The signs, that door, the corbels! HELP! I’m in LOVE! Can I move into her kitchen please??? It looks like there’d be space for you in her walk-in pantry. I’m sure she wouldn’t mind. Ha. I love it ! So fun and funky looking. I am completely blown away. It turned out so lovely! I am especially digging the walk in pantry with the screen door. SO great! But I love it all. Beautiful job! Truly remarkable. 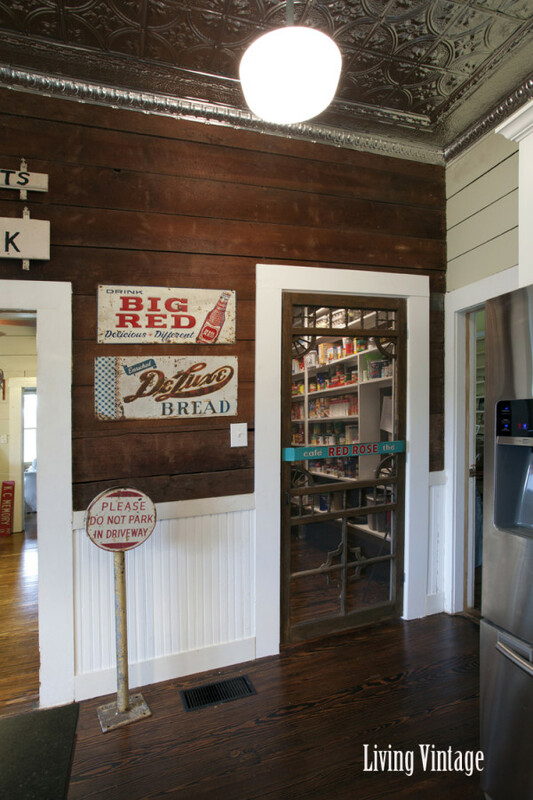 The signs, the pantry, the total character is awesome. Well done. p.s. Julia….I hope that your personal reminder shown above hits home to the few mean spirited people who have lashed out with vicious comments recently that were so over the top that they should be truly embarassed & ashamed of themselves. 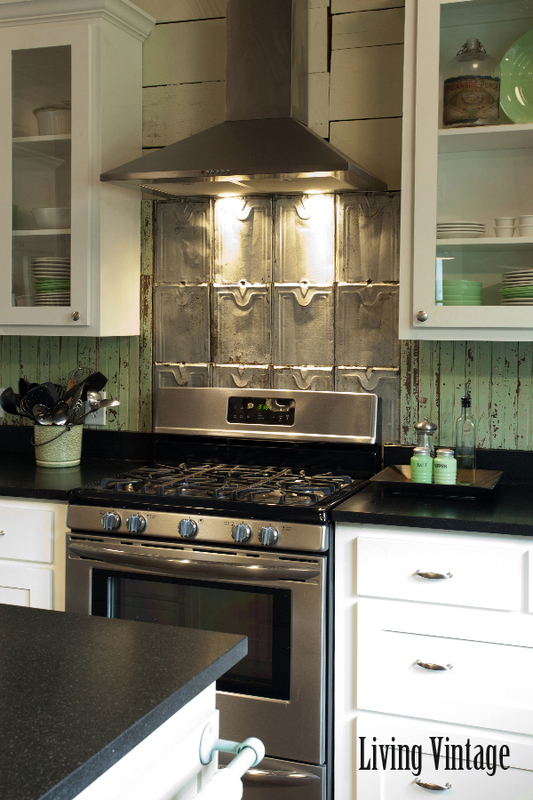 It is obvious that this kitchen was renovated with love and a vintage sense of style. Just lovely! I bet their family really enjoys being in this kitchen. The dark wall with the screen door to the pantry makes me want to go home and watch Fried Green Tomatoes! I love the idea of making a pantry door different, but I would have never thought to do a screen door (mostly because I know how messy I can make things!). Very neat kitchen! Sara, that’s funny – I immediately thought of Fried Green Tomatoes too! Talk about adding character!! Amazing. That kitchen is AMAZING! (And so is the mudroom!) Before now I had never heard of a dogtrot house before. Very interesting stuff! Around here (north central Indiana) I’ve seen lots of shotgun houses, but never a dogtrot house. I love that! What incredible character this kitchen this has! I love it. I absolutely LOVE this!!! The screen door reminds me of “the old market on the corner” kind of atmosphere . . . perfectly charming in every way!! . . . I wish I could do this in/for my kitchen!!! Really Great Transformation! Love the screen door to the pantry! Nicely done! It’s kinda perfect!!!! I love it, and I’m a Mid-century modern type! That kitchen is TO DIE FOR!!!! Such an amazing transformation! Wow, I am blown away by this kitchen! I love, love, love to see rooms restored to match the age & character of the house. This reminds me of so many old places from my childhood. They don’t make ’em like that anymore. Amazing job! That screen door is a perfect example of how fitting your individual personality and history into every space makes it extraordinary. If you were raised in America, you can’t help but feel an instant warm connection with some part of your past when looking at it! What an inspired feature in a totally inspired makeover! PS- And HOW could I forget the wood floors?! Beautiful! I’d love to put a microwave below the counter – but how the heck do you actually use it there?? I’ve seen this idea before and think it’s so impractical – but looks nice. Amazing transformation! This kitchen is truly an inspiration. I would like Kim to come stay with me. She should totally feel free to renovate the kitchen while in residence. 🙂 This is an AMAZING transformation, and most importantly it looks like it’s original to the house. Gorgeous!! Wow! What a great transformation! 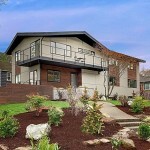 I always love seeing a home that reflects the personality and style of its owners, and this one sure does that! I love, love, love this kitchen! This kitchen is FAB.U.LOUS!!! 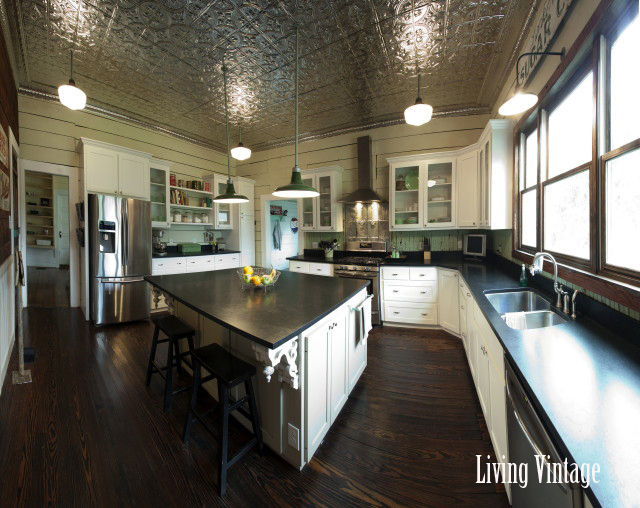 I would die and go to heaven to have a kitchen this size and she did an amazing job keeping the vintage look….and that pantry, OMG. This is just WOW all around! That pantry with the screen door is just the best thing I’ve seen in a while! Love it!!! I love it all! Nice job! 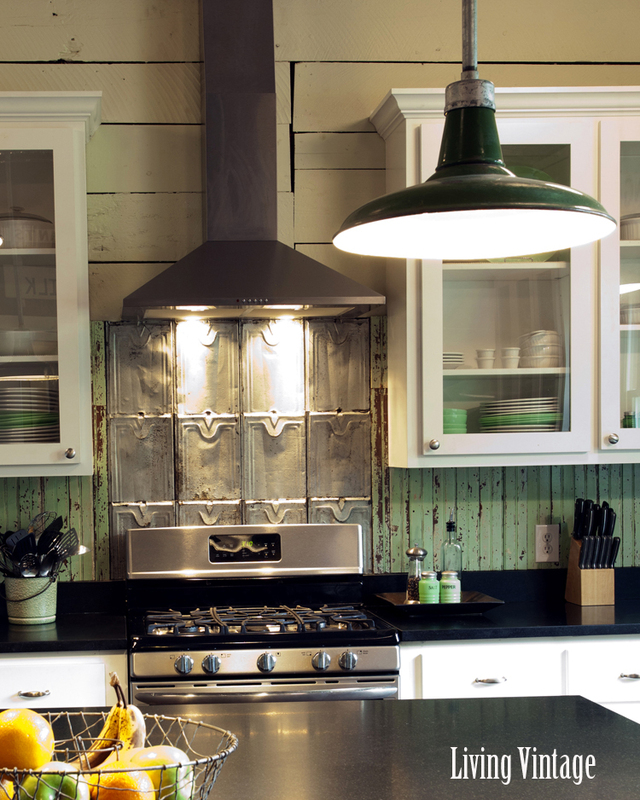 Love the story behind the kitchen, and it’s something most folks can learn from … much better than the high end designs on Houzz. Nice job! Absolutely FABULOUS! Thank you for sharing this amazing transformation. It is magazine worthy! I am being consumed by envy! That’s adorable! I feel like it’s a little vintage grocery. The wall where the pantry door is totally charming. It reminds of the little country store where we used to ride our bikes as kids to buy beef jerky and fireballs. It totally took me back to a different place and time. I love this kitchen. The ceiling tiles are to die for. I have been wanting to do this in the downstairs powder room. And that back splash, instantly took me back to my grandma’s kitchen. Love.. Great job.. I would spend a lot of time in there. I think this is one of my favorite kitchens EVER. I want to live just in the kitchen!! Can’t even pick one favorite element – I love the authentic vintage signs, love the door, the green lights. Clearly a true labor of love. LOVE!!!!!! Love all the details in this kitchen!!! What a great job… I love bringing in those old vintage elements, it’s such a great way to feel connected to the past. And that pantry!! 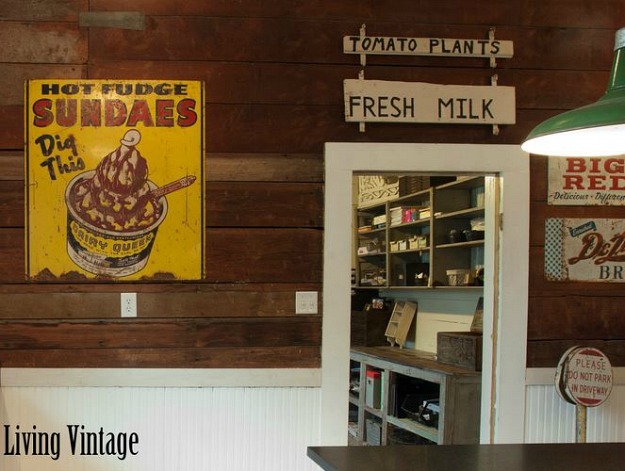 It would be like walking into an old general store every day!! LOVE IT! 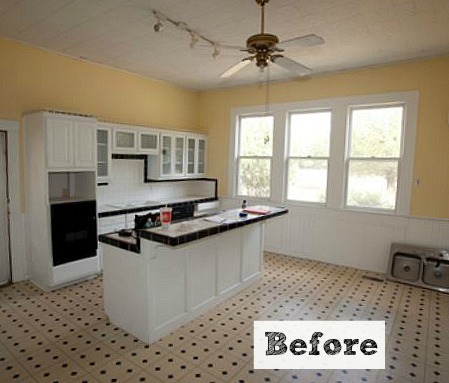 What a great job taking a kitchen backward in time and forward as well. It’s great that she had the raw materials to work with (original floors, wood walls, high ceilings) so that it feels authentic. If it was in a newer house, it would feel more staged. Here, it’s perfect. What an amazing transformation! 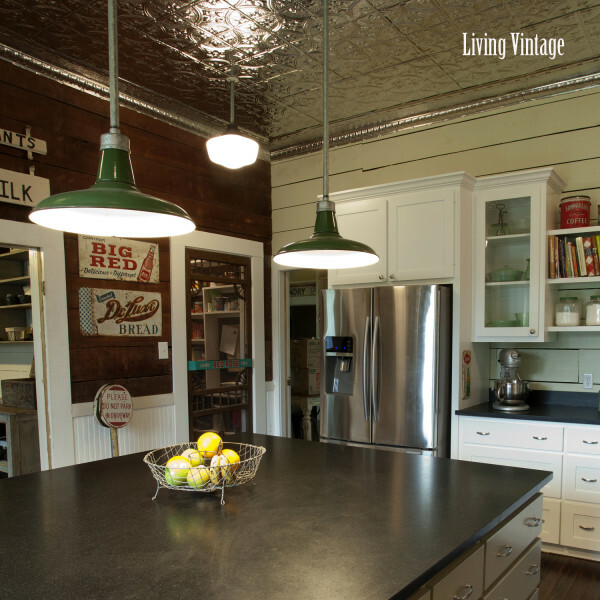 I love the vintage look and feel of the kitchen. Great use of antique furnishing, really gives a very unique feel to the kitchen. Now THAT is my kind of kitchen! Oh the pantry *swoon! 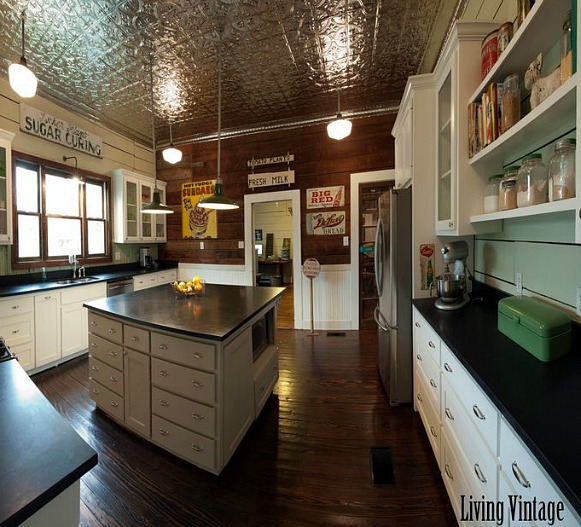 * As a collector, seller, and all around vintage/antique obsessed person, that kitchen is absolutely perfect! Who in the world would put acoustical tiles in a kitchen ceiling?, I have never seen anything done like that before. 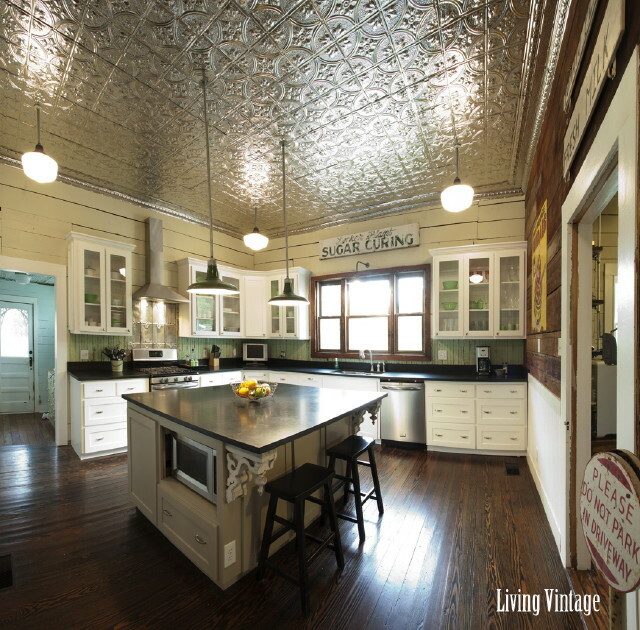 I honestly cannot pick which part is my favorite….the restored floors are so beautiful, but the wood plank walls are amazingly cool, and don’t even get me started on the island corbels!! Love it all!! Oh my gosh…this is FABULOUS! I would KILL for that pantry. Love, love, love it!!! 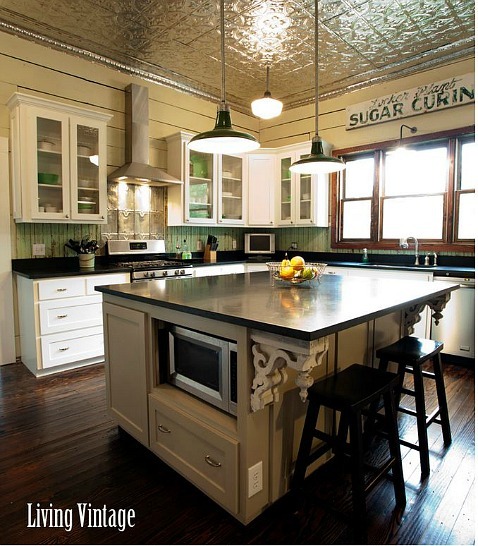 Thanks for the link to the other vintage kitchens and houses, Julia. They are definitely my favorites! I hadn’t seen a couple of them. Fab!!! Love this Kitchen she did an awesome job! That’s a great kitchen! I especially like the pantry door. It makes it look like an old country store. WOW! Love every inch of it…favorites? Well yes, the ceiling and the vintage signs are PERFECT!